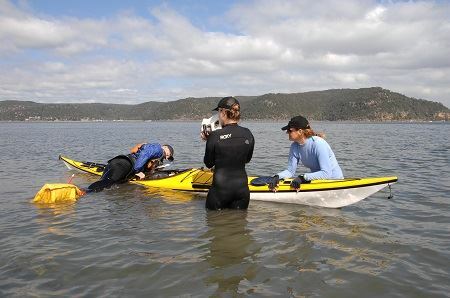 The NSWSKC grading system is based on Australian Canoeing standards and provides a number of pathways including trip leading, training and extending personal sea skills. The club has grades so that trip leaders understand the minimum standard that paddlers have met when taking them out on a trip. This provides a common understanding of techniques for rescues, towing etc. The first step for new members is Grade 1 which includes the ability to wet exit a kayak and swim 50 metres in kayak clothing including life jacket. This grade is designed so that trip leaders can be confident that paddlers are able to safely get out of their kayak if they capsize. The next step is Grade 2: Basic Skills. 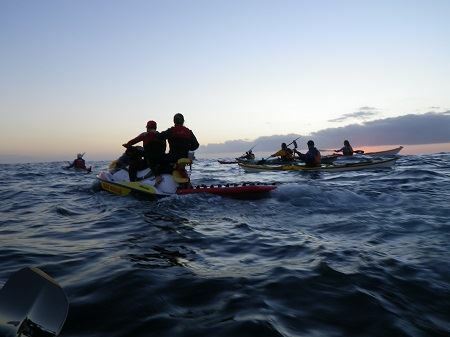 This consists of the basic skills of sea kayaking and includes forward stroke, manoeuvring strokes, rescue techniques, towing techniques, packing your kayak, weather and tides. The objective of this grade is to equip members with the skills necessary to safely participate in club activities, especially those on open water, and to work towards the more demanding sea skills grade. Grade 3: Sea Skills consists of demonstrating the above skills on the ocean and includes an additional navigation component, kayak roll and surf landings. Grades 1 and 2 are both NSWSKC standards, whilst Sea Skills is an Australian Canoeing standard. Once a paddler has attained grade 3 they can go on to further develop their skills as a grade 4 paddler or choose to go down a training or guiding path. For more information on our grading system see our page: Paddler Grading System.